See section 1.8 for search in project. In ApE to search in the project you can press ctrl+f or go to the main menu and choose “Edit”-”Find” (Figure 3.3.3.1) or press the “Find” button in the main tool bar (Figure 3.3.3.2). This will open the “Find” dialog (Figure 3.3.3.3). Figure 3.3.3.1: Opening “Find” dialog in ApE through the main menu. Figure 3.3.3.2: Opening “Find” dialog in ApE through the main tool bar. Figure 3.3.3.3: “Find” dialog in ApE. 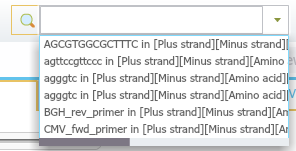 In Genome Compiler you may type a DNA sequence or a keyword in the search bar (Figure 3.3.3.4) in the top right of the screen and click enter, the search results will be displayed in a new tab. Pressing the arrow on the right will open a list with the history of previous searches (Figure 3.3.3.5). There is no need to select a strand since Genome Compiler looks for the sequence in both strands using the standard DNA alphabet including ambiguous bases, and Amino Acid alphabet where applicable. When you search text, the software looks for the query in all features metadata. 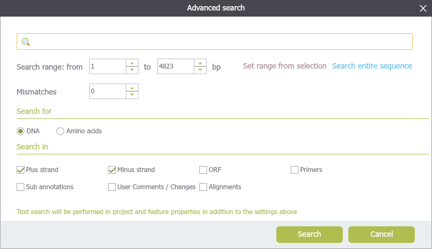 The advanced search dialog (Figure 3.3.3.6) allows for more exact controls over the parameters of searching the current project. To open the advanced search dialog you can either press ctrl+f or click the small gear icon at the top right of the search bar (Figure 3.3.3.4). For more information regarding search in project, please refer to section 1.8. Figure 3.3.3.4: The search bar in Genome Compiler. Figure 3.3.3.5: Opening history of previous searches. Figure 3.3.3.6: Advanced search dialog.